Guard chains were originally designed for a woman to wear around her neck with her fob watch attached and muff chains followed the same principle and were designed to attach to the woolen muff, and here is a very beautiful and very versatile antique 14ct guard chain with pearl and diamond slide. Made in the 1890’s, this incredible piece measures 142cm in length and just looking at the chain for the moment, it is the most wonderful design that feels so tactile as you pull it through your fingers. 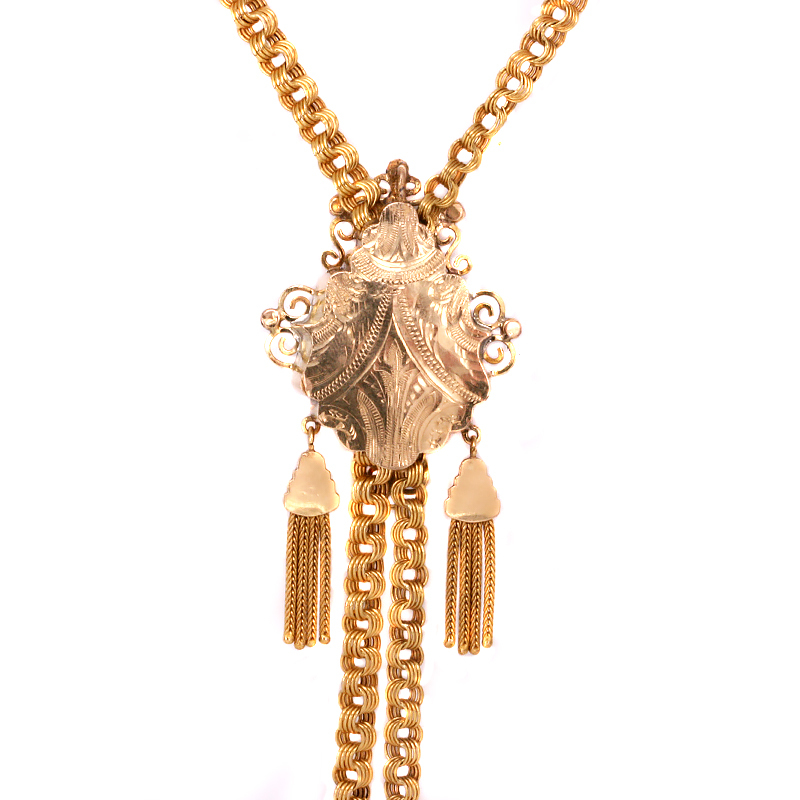 Made in 14 carat gold, it has a lovely rich yellow colour to it and is fitted with a swivel clip at the end. Traditionally this would have been used for attaching it to a pocket watch which can still be easily done today, or even such things as an antique seal, locket or anything your heart desires. Easily able to be wrapped twice around the neck, with the addition of the slide, this will make it even more versatile and able to be worn in a multitudes of ways that will always catch the eye. Then there is the magnificent slide attached. Many of these slides are no longer attached or quite small or simple, yet this one is astonishing. Set with nine seed pearls and three diamonds, there is also a foxtail link tassel set on each side. The design on the front is just amazing and able to be slid up and down the chain and then turning the slide over shows a beautifully hand engraved back which shows the level of attention to detail that the jeweller went to in making this all those years ago. No matter how you choose to wear this piece, it will certainly get the attention that it rightly deserves. Guard chains were originally designed for a woman to wear around her neck with her fob watch attached. Muff chains followed the same principle and were designed to attach the woolen muff to, so when the lady went inside, she could remove her hands from the muff.